The Chicago Half Marathon brought out the cities best. Couldn’t have asked for better race conditions and views of the skyline. Big thanks to guest photographer Bundo Onwueme. For race pictures, contact us. No, I tried picking it up several times but it never stuck. My work schedule is unpredictable and I don’t enjoy working out. [laughs] It wasn’t until I ran my first half that I started running consistently and longer distances. 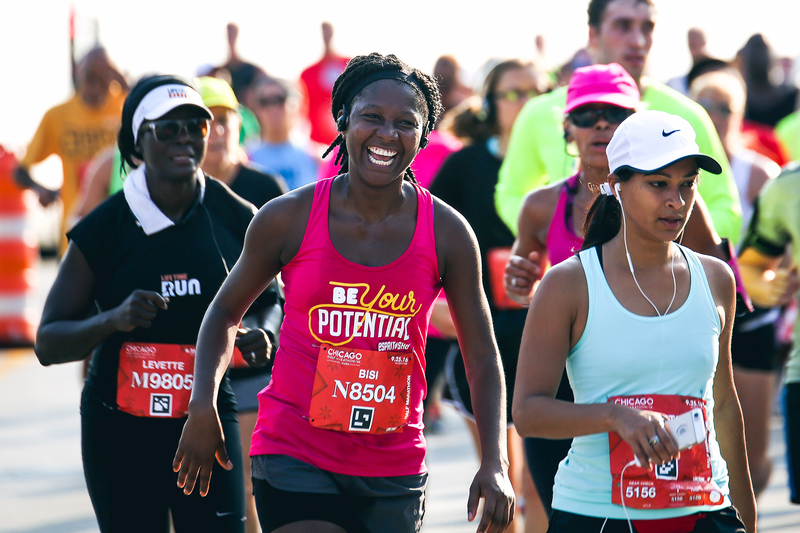 What inspired you to run a half marathon? The hospital I work at sponsored a 5K and paid for everyone’s registration fees. I thought it would be a good opportunity to meet co-workers and start running again. Back then a 5K felt like a half marathon! I enjoyed the race and it inspired me to take on a bigger challenge and run the Chicago Half Marathon. Why did you choose to stick with running? I tried yoga, swimming, you name it—nothing stuck. Running was just next on the list. I started running on a treadmill— it was terrible. I hated it! It felt like I was running in place. I enjoy running when there’s a destination. It’s easier to stay motivated, way more fun, and I get to explore parts of the city I otherwise wouldn’t see. What was it like running the Chicago Half this year? By the time I reached mile 8, my muscles were burning and I reached my limit. I had nothing left. At that moment, I thought about my friend, Sarah. She told me about her experience running a marathon and crying the second half of the race. All she wanted to do was stop running. At the time, I didn’t understand why she would cry over that. Nobody’s making you run, just stop! It wasn’t until this past race did I understand how she felt. I reached the same point—I wanted to stop but I had to keep pushing myself. I even cried a little bit. How did this past race compare to your first? To be honest, I wasn’t as disciplined in my training this year. I kept the same training schedule but skipped the short runs and focused on the longer ones. Because it was my second time, I took it for granted and it affected my performance. The first time I ran, I was so nervous. I printed out a training schedule, ran every mile, and followed every rule. I remember passing 12-miles still full of energy and motivation—passing people I’ve never met before cheering for me! That brought me a lot of joy and kept me going till the end. I thought that alone would be enough to keep me going this year, but it wasn’t—I needed to put the work in. I remember telling myself to, “just have fun.” I had a lot of fun the year before and you can see it in the race photos. Finishing! The last quarter of the race was a struggle. I pushed too fast in the beginning and reached a point where I couldn’t physically go anymore. I placed too much pressure on myself to beat last years’ time. In hindsight, I wish I hadn’t done that. I would have enjoyed the race a bit more. Last year, I had no idea what a good time was. My goal was to finish so I can say I ran a half marathon. I just happened to finish with a good time. The finish line photo they sent me this year said it all. I had pain written all over my face! I did it, I’m here, I’m still alive, I can finally walk, and I’m never doing this again. [laughing] Did you regret signing up for the race? When you cross the finish line, you’re surrounded by joy and celebration. Everyone is smiling, congratulating you, and you feel like you’ve accomplished something. The pain you felt for the past hour disappears. To be honest, I don’t enjoy the process of running at all. I run to catch up on my podcasts. I have friends who love it and run to clear their head. That’s just not me. When I come back from a run, all I want to do is sleep. [laughs] It doesn’t energize me at all. But I committed to running a half marathon and running is the only way to get there. Yeah. Now that I’ve finished two races, I feel like I qualify. I have two HUGE medals to prove it! What is your definition of a runner? It’s about consistency. It has nothing to do with speed or distance. If you can get off the couch and get out there on a regular basis, you’re a runner. The only time I ever experienced it was this past race. As I mentioned earlier, my muscles weren’t conditioned and I lost all feeling in my legs. How did you push past it? You set your sights on the next mile marker and keep going. It always helps if you can see the finish line. Once I turned the corner and saw the finish line, I started sprinting towards it. I didn’t know I had that in me. All I knew was that I needed to get to the other side of that line like, right now! What advice would you give someone thinking about running a half marathon? If it’s something you want to do, but don’t think it’s physically possible—you’re wrong! You can do it! I signed up for the Chicago Half almost as a joke. I didn’t think it was something I would be able to do, which is why I convinced two of my friends to sign up with me. The first step is to find a good training schedule, there are a lot out there. The key is to find one that works well with your work schedule. I found one where the long runs were scheduled on the weekends. It can be discouraging if your training isn’t a good fit. I would talk to a seasoned runner and check out their training routine. Then buy a good pair of running shoes and pace yourself. Don’t try to run too fast, too far, too soon. And lastly, enjoy it. Don’t be so hard on yourself. Celebrate yourself! There’s a lot of people who run, and they all have different reasons. For some people, running is very satisfying whether it takes a lot of their time or a little. For others, no matter how much time they put in, the satisfaction they receive is low. For those people, running may not be the best use of your time. At some point you have to decide how to best spend your time and go after it. Can’t listen to my podcasts without my phone. I don’t remember seeing any costumes in the past two races.